Mateflex CarpetFlex Indoor Tiles Combine The Rich Beauty Of Carpeting With The Dependability Of Modular Flooring. Mateflex CarpetFlex Indoor Tiles have a sturdy construction for long lasting durability and strength. The cushioned surface provides superior comfort, while the underside ensures proper drainage of liquids. Sleek design graces any room with warmth and style. Available in Charcoal and Tan. Requires minimal maintenance, but also provides easy access to the base for repairs, if necessary. Use Flex Edge Male Connecting Pieces and Flex Edge Female Connecting Pieces for added edge protection. Tiles can be self-installed and require no special tools. 10 Year Limited Warranty. Berber Carpet Tiles are Attractive and Offer Heavy Duty Protective Flooring That Withstands Heavy Traffic Areas. 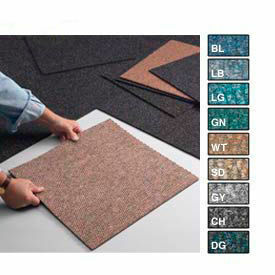 These commercial carpet tiles are made for indoor applications. 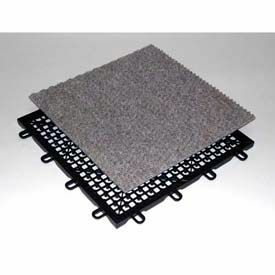 The moisture resistant breathable backing on these berber tiles prevents shrinking and curling. 3/8" & 1/2" thick heavy duty industrial carpet tiles feature stain resistant needlepunch olefin fiber top with anti-static Bitumen backing. Easy installation using adhesive (not included). Sold in case quantities. 3/8" Thick Tiles covers 43 sq. ft. per box. 3 Year Limited Warranty. Pawling Entrance Mats Provide Exceptional Brushing And Drying Performance. 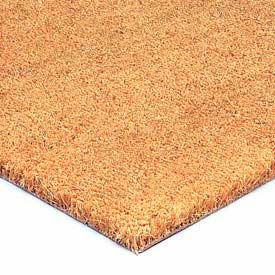 Entrance Mats are Natural Cocoa Mats made of densely-tufted fiber construction for long lasting durability. EM-301 with fibers aggressively remove soil from shoes like a brush. Indian Cocoa fiber bonded to solid vinyl backing. Choice of glue down or loose lay applications. For moderate to high interior traffic. Cocoa Mats are custom cut and non-returnable. Styles are Cocoa Mats, Dura-Tile and Hi-Rib. Available colors are Charcoal, Natural, Charcoal Grey Earthtone, Brown or Black.